Concrete absorbs CO2, but can it solve the cement industry's carbon problem? A better understanding of how carbon dioxide is absorbed by concrete could help scientists accelerate absorption processes and offset a greater proportion of the emissions from cement production, according to new research. It has long been known that Portland cement - the most common type of cement used for making concrete - absorbs CO2 to form calcite (CaCO3). But in light of current day climate change, Liv Haselbach of Washington State University, re-examined carbon absorption processes, focusing on carbon in various different species. To try to understand how carbon is held in the material, Haselbach burnt samples of aged concrete and measured levels of the different gases given off. 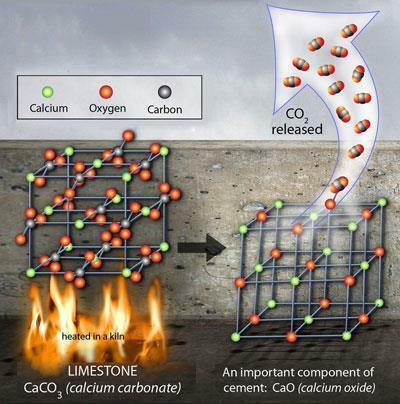 Her work suggests a significant amount of carbon in concrete is held in species other than calcite, although as yet, the exact mechanisms by which these are formed - and the full potential for CO2 absorption - are uncertain. Haselbach plans to carry out the tests at a broader spectrum of temperatures to gain more accurate measurements. According to Rod Jones, a civil engineer at the University of Dundee, the research is technically sound, but it doesn’t solve the cement industry’s colossal carbon problem. ’CO2 is important, there’s no question. But we’ve always known that carbonation takes place and it’s not the solution. You cannot sequestrate 100 per cent - it’s just not possible,’ he says. Haselbach argues that if the mechanisms of CO2 absorption in concrete were better understood, they could be accelerated in the phases of its life cycle when more surface area is exposed - such as when concrete is recycled after a building demolition. Jones thinks the real solution to the problem lies in producing new forms of environmentally friendly, non-Portland cement. He says these should incorporate construction industry by-products such as fly ash and slag, which are available in large quantities.